Opticis launched DHFC-200D, DisplayPort 1.2 to HDMI 2.0 converting Active Optical Cable, first time in the market. 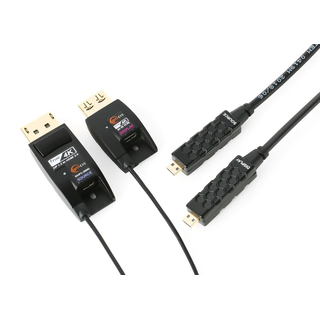 DHFC-200D enables to convert DisplayPort 1.2 signal to HDMI 2.0 signal, and extends 4K (4096x2160) at 60Hz up to 100m (328feet) over plenum graded (or LSZH) hybrid cable. It avoids any scaling or data compression for lessening a burden of data transmission. DHFC-200D is designed compact enough to be fitted into various installation environments with cutting edge technology performance. DHFC-200D offers perfect flexibility during installation by separating DisplayPort and HDMI connector part and Active Optical Cable part. It gives slim, light, easy installation like a general copper cable, moreover DHFC-200D converts DisplayPort 1.2 signal to HDMI 2.0 signal and extends this signal much longer than general copper cable.